With only one day left until Fall Snapper season opens all signs say it’s gonna be full of action. 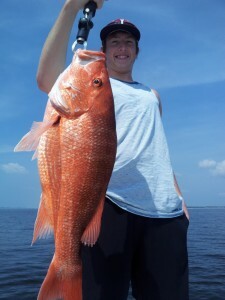 Recent trips have produced plenty of Snapper and Grouper without even leaving the bay. Regular clients of Lost Bay Guide Service have always seen piles of legal Snapper in the bay and most have scheduled their trip this Fall and are excited to have another opportunity this year to take a few home. Along with Snapper we have been finding some really nice Grouper holding on the same spots. Though i specialize in shallow water fishing with artificial baits the occasional bottom fishing and specialty Shark trips are always a hit. If your thinking about a fishing vacation now is the time to book. As the water temperatures start to drop the fishing will continue to get better and better with the arrival of the Bull Redfish and will stay strong until early March. As always Tight Lines and we look forward to fishing with you soon.